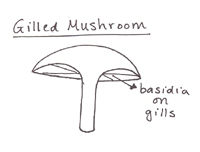 What Exactly is a Mushroom? Mushrooms are a type of fungus. There are many different kinds of fungi, including molds and crusts, as well as more developed types that have a stalk and a cap. Fungi are distinct from plants because they do not possess chlorophyll, the green pigment that allows plants to manufacture sugar from the sun's energy; they need to absorb their food from the environment in which they live. Fungi use fibers called hyphae (that as a group are referred to as mycelium), to take in food. The mycelium can remain dormant under the ground for many seasons, similar to the roots of plants. Each hypha that is sent out makes its way through earth/wood/plant matter until it reaches the surface. 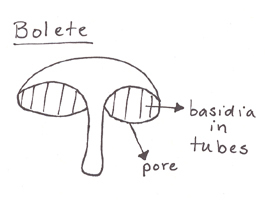 During the organism's specific growing season, the hyphae develop into mature structures capable of reproducing spores. The structure that you normally see above the ground is the part of the mushroom that is producing and dispersing spores. Each spore is a single cell that is capable of sending out a hypha that will develop into a group and form its own mycelium. If the hypha of one spore meets up with the hypha of another, it begins the sexual process of spore prodcution through special spore-producing cells. The spore of a mushroom contains all of the necessary materials to form a new fungus. When the spores of a mushroom are released, they may travel a certain distance before they land. The single cell then sends out hyphae to help establish the fungus and gather food. After the spore has sent out its hyphae, they will eventually meet up with the hyphae of another mushroom. After the sexual process of reproduction has begun, the mushroom forms the structures of a "fruiting body" that will eventually produce and disperse spores. 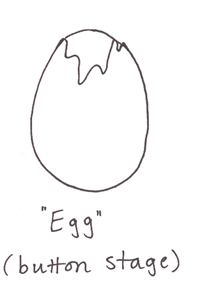 The egg/button stage is the early form of this fruiting body. The mature fruiting body can have various structures. The picture at left is that of an Amanita, one type of mushroom. The fruiting body may contain a cap, stalk, ring, volva, and gills. The cap normally houses the spore producing surface of the fruiting body. 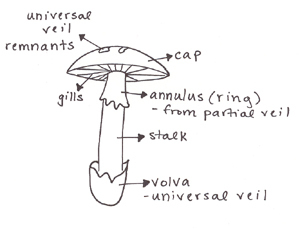 In the case of the Amanita, the spore-producing cells are in the gills, but in other types of mushrooms, spores are produced in tubes or inside the cap. 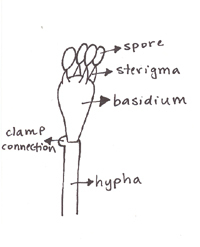 By comparing this illustration to the spore above, it is evident which parts of the spore develop into specific structures of the fruiting body. 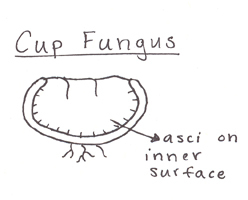 In cup fungi, the spore-producing asci are located on the inner surface of the mature fruiting body. 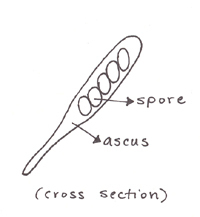 Spores are released in a cloud when the asci break open. Gilled mushrooms have basidia located on the gills on the underside of the cap. The spores are dropped from the gills when mature. In boletes, the basidia are located in tubes within the flesh of the cap of the mushroom. The spores are released through pores in the surface of the underside of the cap. 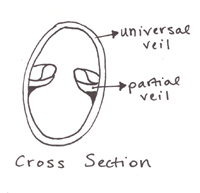 The basidia in puffballs are contained entirely within the body of the mushroom. A cloud of spores is released when the outer covering collapses or explodes.